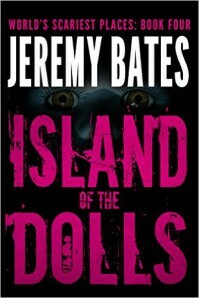 On the Outskirts of Mexico City lies Isla de las Munecas - a reportedly haunted island that is home to thousands of dolls. A group of people are going to film a documentary on this island against the boatman's better judgement to wait until the storm passes. While stranded there overnight, the wind and rain add to the already spooky atmosphere but when they discover a dead body they begin to realize that something evil really is lurking on the island. This was a fast-paced read. I really liked the setting and felt as though I was there. Most of the characters were unlikable but they did feel real and I liked that they were different from one another and had their flaws. A lot went on during the last couple of chapters but overall I was happy with the ending. Another good read from the World's Scariest Places series!